I was supposed to be heading out for a run tonight but, as is usual, I was distracted by yet another Smashing Magazine post that had some tutorials I thought I would try out. Being a bit of a sci-fi fan ... and somewhat lacking in artistic talent ... I tend to marvel at some of the artwork that people create and wonder at how they did it. I know that there are numerous tutorials tucked away in every corner of the net and I have tried them before, but never with much success. 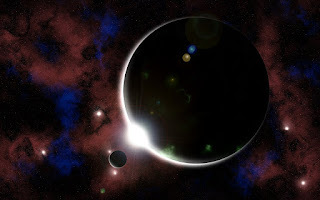 However, yesterday's post filled with 50 Photoshop Tutorials for Sky and Space Effects, got me thinking I should have another crack at it, so I thought I would try out the second one down, the Space and Planet Tutorial. Hmmm, a tad over-zealous with the lighting and Clark Kent colours! Hey that's pretty good! Well done! !